Well ladies and gentlemen…. It was about to happen eventually since I enjoy the outdoors. From camping, to backpacking, to kayaking…. Yep I’m getting into hunting. Now I’m no stranger to firearms I’ve personally owned a .22lr for a few years which I shoot for target practice at the local range. The old fashioned pump shot gun that you see commonly. Basically you chamber the round manually by pumping the forend of the weapon. Once the round is fired you pump the forend again which ejects the spent round and loads the next round (if there is one). The auto loaders basically chamber and eject the rounds automatically after you fire each round. They do so by using the gas ejected from the rounds once they are fired and use the force pressure to move the action of the weapon. Pro – Less jams than an autoloader therefore reliability is strong. However, if you do “short stroke” your weapon you will cause a jam so it is essential to perform a full pump on the weapon. You can feed just about any shotgun ammunition (within the specs of the barrel) with confidence you can cycle the ammunition without worry. Con – More felt recoil due to the construction of the weapon. Pro – No pumping so sending more ammunition to your target in less amount of time by just squeezing the trigger. (to be noted that an experienced pump shotgun owner can unload a serious amount of ammo at their target as well. But in the inexperience hands an auto loader is just super quick). Con – If not kept clean the auto loader will tend to jam (either failure to feed a round or failure to eject a round). Sometimes these jams can take a little bit to clear. Also, some ammunition (lower velocity rounds) don’t have enough gas power to allow the shotgun to automatically feed and eject a round. Understanding what ammo works for your auto loader and cleaning after each outing starts to become very important. In the end I chose the Mossberg 930 SPX Autoloader. I was intrigued by the autoloader and the reviews on this particular shotgun won it the 2009 shotgun of the year not to mention it was half the price than other auto loaders on the market. As with any firearm there was some “break in” period. I experienced 5 jams (failure to feed and a log jam in the feeding area were the common problems) the first outing shooting 165 rounds down at the range. I went home and did a detailed cleaning of this weapon and have put an additional 300 rounds in this with zero failures. I’m confident in this weapons ability to fire upon command now. Being that this is my first shotgun I also wanted something that was double duty (home defense and hunting) so I will order a 24” threaded barrel which can accept chokes for hunting…. What the hell does that mean??? Yeah I’ll get into it. 20” long barrels and shorter – usually primarily for home defense. The shorter barrel makes it easier to maneuver around your house and around corners. These barrels are suited for shooting distances up to 25 yards really accurately (which in home defense is VERY far). These barrels are also very accurate for longer distances but seem to be preferred for the home defense situation.To be noted I’ve hit paper targets with my 930 SPX which has an 18.5” barrel length at 50 yards with both slugs, buck shot and bird shot (Click Here for an Example). 24”-26” long Barrels – This seems to be your general hunting length for shotguns. Turkey and Deer seem to be the most common but you can use it for other game as well. 28” and longer Barrels – This seems to be the preferred length for water fowl hunters. So if you wanted a gun dedicated to hunting ducks and such this is the length you would probably want to shoot for. The barrels also have 2 commonly used bores (or the inside of your barrel) which is a rifled bore or a smooth bore. A rifled barrel is grooved on the inside so the purpose is primarily dedicated to shooting slugs. More importantly sabot slugs. What this does is improve the accuracy of the shotgun over a longer distance (upwards to 150 yards). A smooth bore barrel is just smooth all the way through. With this barrel you can shoot a variety of ammunition from bird shot, to buck shot and even slugs. Although the accuracy of shooting a slug is less than a rifled barrel you still have decent accuracy especially when using a rifled slug (the slug is grooved to replicate the spin a rifled bore would put on the slug). Chokes… yeah what’s a choke… that’s what I said too. Well here’s the story – when you shoot bird shot and buck shot you are actually expelling several tiny little projectiles toward your intended target. 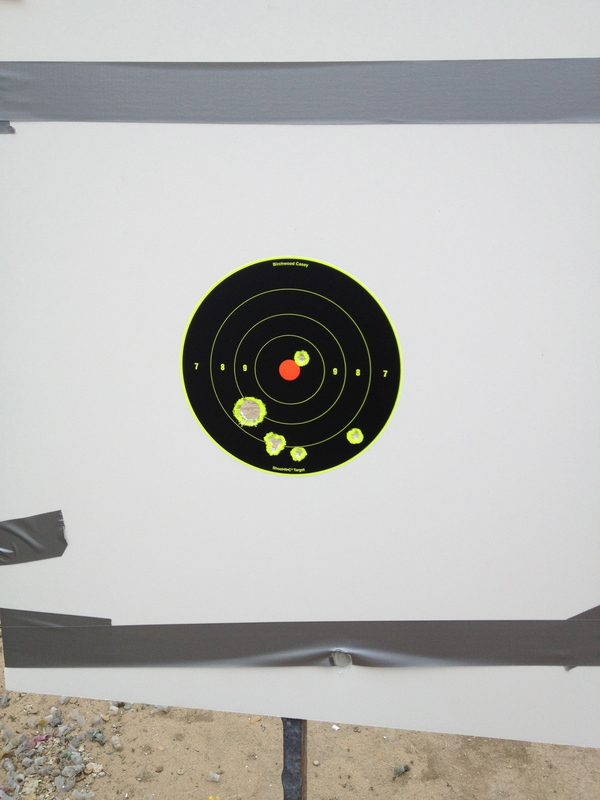 Now depending on how far your target is the shot will start to expand thereby making a larger impact and if far enough having a lot of that shot miss the target and stray into parts unknown. In reality you want your shot to hit your intended target in a small area to effectively kill. So, the remedy to maintaining a tighter “pattern” (I’ll get into that later) is to constrict the shot once it leaves your barrel to keep it in a tight pattern over a longer distance. That’s basically what a choke does. There are several types of chokes (Cylinder, Improved Cylinder, Modified, Full). Each one has an intended purpose based on the game you are looking to fell for hunting. However it has to be said that all barrels can not accept chokes. You will need a barrel that is threaded to accept chokes. And for the love of god never fire your weapon threaded for chokes without a choke because you will screw up the threading and making it very expensive for yourself to correct the problem with your local gunsmith. Now here’s where it started to get really overwhelming to me regarding the subject. The overwhelming problem is that there is so MANY types of ammunition for shotguns. It actually becomes overwhelming. Bird Shot – Used to kill birds and small game. Seems to be the cheapest form of ammunition as well as you can pick up a box of 100 rounds of # 7 ½ or # 8 from your local walmart, dicks sporting goods for about $30. Also, great for shooting rounds down the range as the recoil isn’t as bad as the buck shot or slugs because the mass of the projectiles leaving the barrel isn’t as big. Buck Shot – Used to kill larger game. 00 Buck Shot is also the preferred use for home self defense as the impact is very devastating especially at close range (20 feet). However, if you live in an apartment where your point of confrontation normally would occur where a missed shot might shoot through a wall containing a neighbor you might also consider the # 1 buck shot as studies have shown the stopping power is very good but it wont over penetrate as much as 00 buck and end up killing your neighbor through the wall by mistake. Rifled Slugs – Used for killing large game (including Deer) with a smooth bore. Could also be used for home defense. But as stated in the Buck Shot the slug will penetrate through a lot of items so be wise in choosing this as your method of home defense. 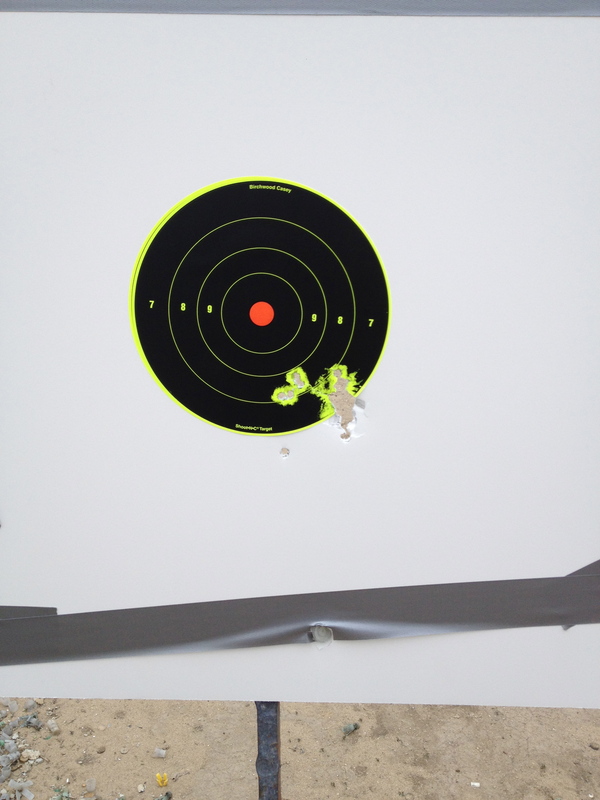 Effective range from a smooth bore and a rifled slug is between 50-75 yards. Sabot Slugs – Specifically designed slugs for the use with a rifled bore. Most accurate for long distances. Effective range of a sabot slug from a rifled barrel is between 100-150 yards. Sizes of ammo as well as the force at which they leave your barrel vary which is measured in feet per second (fps). In an effort to reduce the size of this blog just know that the bigger the shell the bigger the force and the bigger the recoil of your weapon. Also, check your ammo’s fps rating as the higher the fps rating the increase in recoil. When firing the shotgun it is important to keep the buttstock of the weapon firmly placed within your shoulder. Due to the high recoil of this weapon you want to minimize any impact that the firearm can do on your shoulder. The cheek weld – In order have the proper firing position with your shotgun you will need to have your cheek resting on the stock. Proper placement is just below your cheek bone and above your jaw bone in the fleshy section between the two. This allows you to line up your sights properly and also aides in reducing the felt recoil. Lean into your weapon – As mentioned the shotgun’s recoil can be significant (especially using high velocity rounds) and if you are not properly positioned it can move you around. 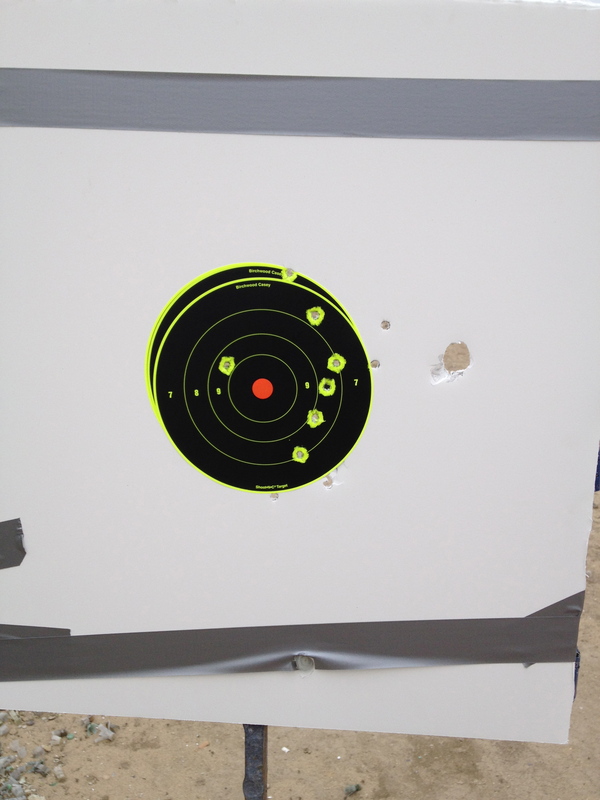 Leaning forward a bit will help maintain target reacquisition after each round fired. Also keeping your back leg locked will help guide the force of the recoil into the ground. Hand on the forend of the weapon – It is actually common practice by noobs (including me!) to have both hands pull the weapon into your shoulder in anticipation of the recoil. However, I have been reading that the hand on the forend should actually be pushing away from you. This will lessen the recoil felt as well as help maintain proper target acquisition after firing. My main issue is that my Mossberg 930 SPX came with ghost ring rear sights and fiber optic front sights which are elevated off the weapon. Therefore my problem was I could not achieve a proper cheek weld with the weapon and acquire my target through the sights. So initially I did not have a cheek weld and fired looking through the sights but I found my shotgun moved around too much so reacquiring my target quickly became difficult. My next solution was to move the buttstock of the weapon higher on my shoulder. Now if you pay attention to the buttstock it is actually curved to form into the contour of your shoulder. In order to achieve a good cheek weld I actually had the curved part jammed into my shoulder. Although it didn’t hurt to fire the weapon I could tell this just wasn’t the correct way to hold and fire this weapon. A little research and a solution will generally present itself to you….. comb raisers. Yeah I had no idea either. What a comb raiser does is it creates a lift on the stock where you rest your cheek and allows you to achieve a proper cheek weld and shoulder your weapon properly. You can actually make one yourself by using duct tape and some closed cell foam pads (think yoga mats) or purchase one. I initially made one to see how much “lift” I needed to achieve a proper cheek weld and can view through my sights. I found it to be exactly 1 inch so then I went looking for a comb raiser that fit the bill in that area. I just didn’t like the fact that my shotgun stock was covered in duct tape… ya know. Once a determination of the type of ammunition you want to use (home defense or hunting) you want to hit the range and pattern the shot of your weapon. What that means is you want to see what kind of spread your shot will make at various distances (10 yards, 15 yards, 20 yards, 25 yards, etc). The goal is to keep your shot within a 10 inch diameter. Remember the tighter your pattern the more effective your kill. Also, not all shotguns pattern the same. So you will need to try out a variety of different manufacturer’s who produce the type of shot you want to shoot to determine which brand achieves the tightest pattern with your shotgun. The right ammunition combined with a choke will yield the best results. It just takes a little time and it’s an excuse to go out and hit the range! As with something as dangerous as a firearm safety is always your top priority. Especially if you have children in the house you will need to take the best precaution you can that’s within your budget. Be safe and hope this helped you out. Since you are a new gun owner here is something that may impact you as well as many others myself included. I don’t know how true it is but the administration is totally anti 2nd Ammendment.